Core weakness? Or problem with glute firing? 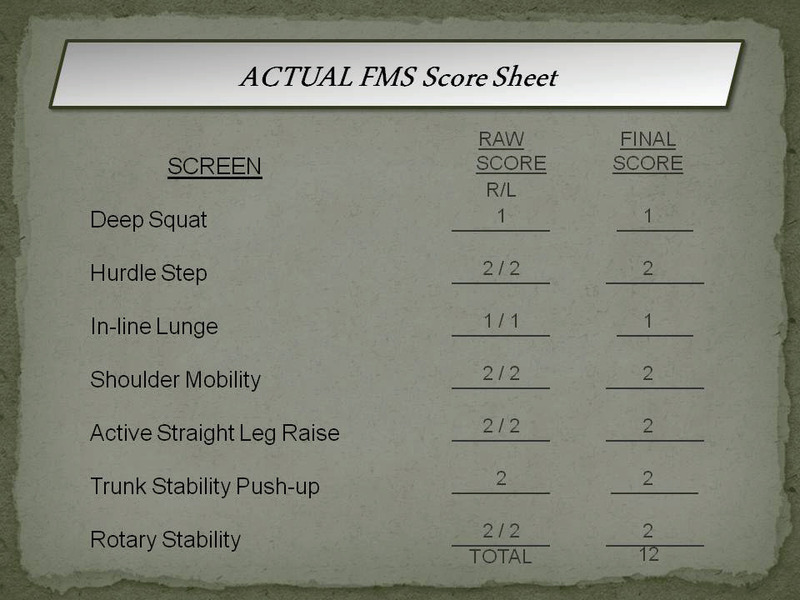 Alwyn Cosgrove uses the Functional Movement Screen to identify dysfunctional problems and program accordingly. Now look at the real screen. Do you see the changes? Let me explain what that means if you’re not familiar with FMS screening. That means she can’t do the lunge at all. She cannot stabilize on the board. You get a ‘1’ for showing up, right? A ‘1,’ means you’re here. She’s a ‘1’ in the deep squat. Everything else is legitimate. Based on this additional information, what would you change. This is your program. This is the fat loss template we created as a group. Does this new information suggest an additional step before this, or does it suggest we delete something? Let’s go through it. Is there any reason to delete planks? No. Let me give you a clue. She can’t stabilize on the lunge, and still runs a 5K. She’s running a 5K and she’s not in pain. How can she do a 5k? A 5K is 3.2 miles. One mile is 1,500 plyometric repetitions at two to four times bodyweight landing forces. She’s using 4,500 repetitions of shortstep lunges. She cannot do one regular lunge. She can’t stabilize the lunge. What major muscle group may not be working here? Is her core a problem? No, we can take that off the list. The glutes would be an issue, right? Now, how do we make the glutes fire? We could do glute activation work. We can get her in isolation, but does that transfer to moving? Where is she getting the stability? She is getting her stability from either her quads and hamstrings or her lower back. How do I make sure she gets it from the glutes? Bridging may get the glutes, but it may not transfer to standing up. Looking for exercise choices for glute firing?